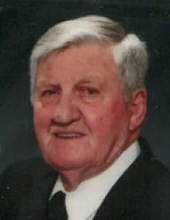 Maynard Thompson, 88, of 1734 Cox Road, Ridgeway, VA passed away on Saturday, February 9, 2019. He was born on April 26, 1930 to the late Sidney Thompson and Dora James Thompson. In addition to his parents, he was preceded in death by his brother, Hoss Thompson. Mr. Thompson served in the United States Army and had retired from DuPont where he worked for 30 years. He attended Goodwill Primitive Baptist Church. He is survived by his wife, Elaine Gaynelle Cox Thompson of the residence; daughters, Sandra Thompson Butler of Ocala, FL and Penny Thompson Most (Joe) of Ridgeway, VA; son, Gary Thompson (Melissa) of Ridgeway, VA; sisters, Crystal Thompson LaMont of Charlotte, NC and Nancy Thompson Trent of Myrtle Beach, SC; brother, Ford Thompson of Bassett, VA; grandchildren, Heather Holland, Marc Butler, Joey Butler, Alex Thompson, and Zach Thompson; and three great-grandchildren. A funeral service will be held at 11:00 a.m. on Monday, February 11, 2019 at Norris Funeral Services Martinsville Chapel with Elder Jesse R. Hutchins officiating. Visitation will be held from 5:00 p.m. to 7:00 p.m. on Sunday, February 10, 2019 at Norris Funeral Services Martinsville Chapel and other times at the family residence. Burial will be at Mountain View Cemetery in Ridgeway, VA. In lieu of flowers and food, please make contributions to Goodwill Primitive Baptist Church c/o Elder Jesse R. Hutchins, 2052 Snead Road, Stoneville, NC 27048. Norris Funeral Services and Crematory of Martinsville, VA is serving the Thompson family. Online condolences may be made at www.norrisfuneral.com. To send flowers or a remembrance gift to the family of Maynard Thompson, please visit our Tribute Store. "Email Address" would like to share the life celebration of Maynard Thompson. Click on the "link" to go to share a favorite memory or leave a condolence message for the family.